Here’s is the today’s Daily GK Current Affairs of 11th August 2018. Here we have given the latest updates with important news and GK Current Affairs for upcoming bank exams, online government exams. The GK Current Affairs you can also access through PDF. 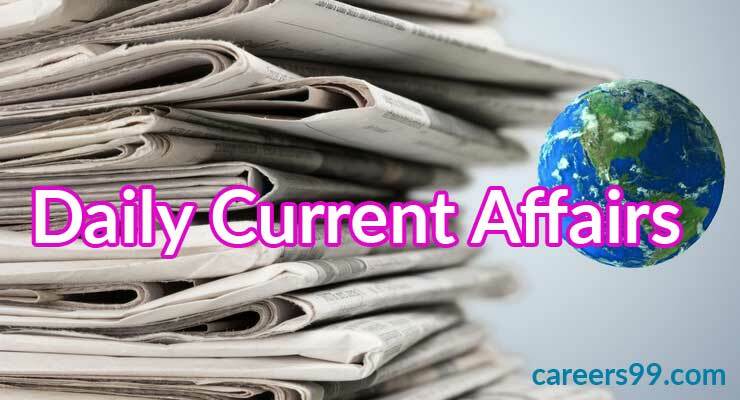 Check this Daily Current Affairs Video and acquaint yourself with the current events for the preparation of various Government Exams. Through this portal, environment clearness will be done very easily for the related forest and climate issues. Modi also approved the 1st project which is being built in Odisha through Passport. Nirmala Sitharaman a defense minister and Yogi Adityanath a UP Chief Minister started a defense industrial corridor in Aligarh Uttar Pradesh. To develop special areas it is the main step of government efforts to defense production in the state. Agra, Aligarh, Lucknow, Kanpur, Chitrakoot and Jhansi are the 6 Nodal points for the corridor of the state has been identified. The Minister of Culture (I / C) and Forest Environment State and Climate Change, Dr. Mahesh Sharma inaugurated the ‘restricted literature of my freedom struggle’ (freedom movement through prescribed literature) in the premises of National Archives of India in New Delhi. The exhibition was based on the unique collection of potential literature in its coverage. This exhibition of future literature was from a vast collection of poetry and prose that reflects nationalist zeal in the days of freedom struggle. As part of the initiative of the SCO, the SCO Peace Mission is organized biennially for SCO member countries. Joint exercises for the year 2018 will be conducted from 22 August to 29 August 2018 in Chebarkul, Chelyabinsk, Russia. He was inspired to make Rashmi after watching the ‘Manfabad Machine’ Sofia ‘in Hong Kong in 2016. In a function held at Raj Niwas in New Delhi, Lieutenant Governor Anil Baijal administered the oath of Justice Justice Rajendra Menon as the new Chief Justice of Delhi High Court. Justice Menon was the first Chief Justice of Patna High Court. Prime Minister Narendra Modi said 12 modern bio-fuel refineries of Rs 10 thousand crores would be set up across the country. He was addressing a program on the occasion of World Biofuels Day 2018 in New Delhi. Due to high production in the mining, manufacturing and power generation segments, industrial production registered a high growth rate of 7% in June of four months. Cumulative growth for the period April-June 2018 was 5.2% during the same period of the previous year. Deputy President Mike Pence announced that the US Department of Defense will build a space force as the sixth branch of the Army by 2020. Pence said that progress in space technology made it clear that space is the new battlefield for the 21st century. When hitting the 23rd time against England at Lord’s, India captain Virat Kohli left behind to become the Johnny Bairstow of England international cricketer with most runs this year. Kohli scored 1,404 runs in 25 innings this year, which is 15 more than the English wicketkeeper-batsman. Santali Wikipedia has become the first Indian tribal language to receive the Wikipedia version in its own script after this month. Officials said Wikipedia contributors from India, Bangladesh and Nepal have prepared content for the page. According to the 2001 census, Santhali is written in Oli Chiki script and spoken by 6.4 million people. According to the Think Tank PRS Legislative Research, in the recently concluded Monsoon Session, 110% productivity has been observed in the Lok Sabha, which is the highest in 18 years. The Lok Sabha had spent 50% of its time on legislative business and the highest number of bills of personal members started from 2000 on 999 bills. Kerala Pinarayi Vijayan has announced that the Kerala government will present the bill for the reversal passing through sexual transit operations. The amount of Rs 2 lakh will be reimbursed in the form of hospital expenses, while those who have already done such surgery, they can also apply for reimbursement. Prior to this, Tamil Nadu had announced free sexual transformation surgery for the reverse in government hospitals.